Born in Karlsbad, Bohemia, in Austria-Hungary (present-day Karlovy Vary, Czech Republic), Frank was taught by his father (a proponent of Georg Ritter von Schönerer's policies) about nationalist agitation. Frank attempted to enlist in the Austro-Hungarian Army in World War I, but he was rejected due to blindness in his right eye. He spent a year at the law school of the German language Charles University in Prague and worked as a tutor to make money. 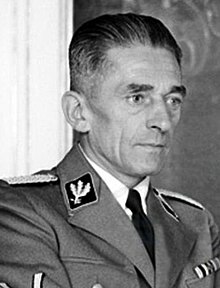 An extreme advocate of the incorporation of the Sudetenland into Germany, Frank joined the German National Socialist Workers' Party (Deutsche Nationalsozialistische Arbeiterpartei; DNSAP) by 1923 and was involved in setting up several DNSAP chapters in northern Bohemia and Silesia. In 1925, Frank opened a book store which specialized in National-Socialist literature. Frank joined and helped organize the Sudeten-German Homeland Front (SdH) in 1933, which officially became the Sudeten German Party (SdP) in 1935. He then worked in the SdP public relations and propaganda department. In 1935, Frank became deputy leader of the SdP and was elected a member of the Czechoslovak Parliament. Coming to represent the most radical National Socialists in the SdP, Frank was made Deputy Gauleiter of the Sudetenland when it became part of Germany in October 1938. 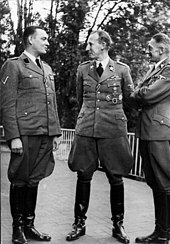 Frank officially joined the Nazi Party and SS on 1 November 1938. In 1939, Frank was promoted to SS-Gruppenführer and appointed Secretary of State of the Reich Protectorate of Bohemia and Moravia under Reich Protector Konstantin von Neurath. Himmler also named him the protectorate's Higher SS and Police Leader, making him its ranking SS officer. Although nominally under Neurath, Frank wielded great power in the protectorate. He controlled the Nazi police apparatus in the Protectorate, including the Gestapo, the SD, and the Kripo. Hitler's decision to adopt a more radical approach in Bohemia and Moravia should have worked in Frank's favor. Hitler relieved Neurath of his active duties on 23 September 1941, though he still remained Reich Protector on paper. Frank hoped to be appointed as Deputy Protector and day-to-day head of the protectorate, but was passed over in favor of Reinhard Heydrich. Heydrich was brought in to enforce policy, fight resistance to the Nazi regime, and keep up production quotas of Czech motors and arms that were "extremely important to the German war effort". The working relationship between Frank and Heydrich was a good one as they both were ambitious and brutal. They launched a reign of terror in the protectorate, arresting and killing opponents and ramping up the deportation of Jews to concentration camps. According to Heydrich, between 4,000 and 5,000 people were arrested and between 400 and 500 were executed by February 1942. When Heydrich was assassinated in 1942, Frank was once again passed over for promotion to Deputy Protector; Kurt Daluege was chosen instead. Daluege and Frank were instrumental in initiating the destruction of the Czech villages of Lidice and Ležáky in order to take revenge on the Czech populace for Heydrich's death. When it came to the population of Lidice, Frank ordered Horst Böhme, the SiPo and SD chief in Prague, to shoot all the men, send all the women to concentration camps, and place those few children considered worthy of "Germanization" in the care of SS families in Germany, with the rest being murdered. Under Daluege, Frank continued to consolidate his power, and by the time Wilhelm Frick was appointed Reich Protector in 1943, Frank was the most powerful official in Bohemia and Moravia. In August 1942, he was made a Minister of State as Reich Minister for Bohemia and Moravia. In June 1943, he was promoted to SS-Obergruppenführer and General of Police in Prague. Frank was also made a General of the Waffen-SS. In 1944, he personally conducted anti-partisan warfare in Moravia aimed at destroying the Jan Žižka partisan brigade. Despite the deployment of 13,000 soldiers and summary executions of civilians suspected of supporting the partisans, the Germans were unable to destroy the partisan brigade and falsely concluded that the threat had been eliminated. Frank was arrested by U.S. Army troops in the area of Rokycany on 9 May 1945. He was extradited to the People's Court in Prague and tried in 1946. After being convicted of war crimes and the destruction of Lidice and Ležáky, Frank was sentenced to death. He was hanged on 22 May 1946 in the courtyard of the Pankrác Prison in Prague, before 5,000 onlookers. He was buried in an anonymous pit at Prague's Ďáblice cemetery. Frank was married twice. On 21 January 1925 he married Anna Müller (born 5 January 1899 in Karlsbad). The couple had two sons Harald, born 20 January 1926, and Gerhard, born 22 April 1931. They divorced on 17 February 1940 and later that year, Müller married Karl-Hermann's successor as deputy Gauleiter of Sudetenland, SA-Brigadeführer Dr. Fritz Köllner. On 14 April 1940 Frank remarried a physician, Karola Blaschek (born 13 August 1913 in Brüx). The couple had three children together, two daughters Edda, (born 16 August 1941) and Holle-Sigrid (born 8 March 1944), and a son Wolf-Dietrich (born 20 August 1942). ^ a b Miller 2006, p. 362. ^ a b c Miller 2006, p. 356. ^ Miller 2006, pp. 356, 357. ^ a b Zentner & Bedürftig 1991, p. 290. ^ Miller 2006, p. 355. ^ Miller 2006, p. 358. ^ Suchánková 2013, p. 11. ^ a b c Williams 2003, p. 82. ^ Miller 2006, pp. 359, 364. ^ Bryant 2007, pp. 140–143. ^ Miller 2006, pp. 359–360. ^ Zentner & Bedürftig 1991, pp. 290, 291. ^ Miller 2006, pp. 355, 359–360. ^ Hrošová 2012, pp. 93–105.